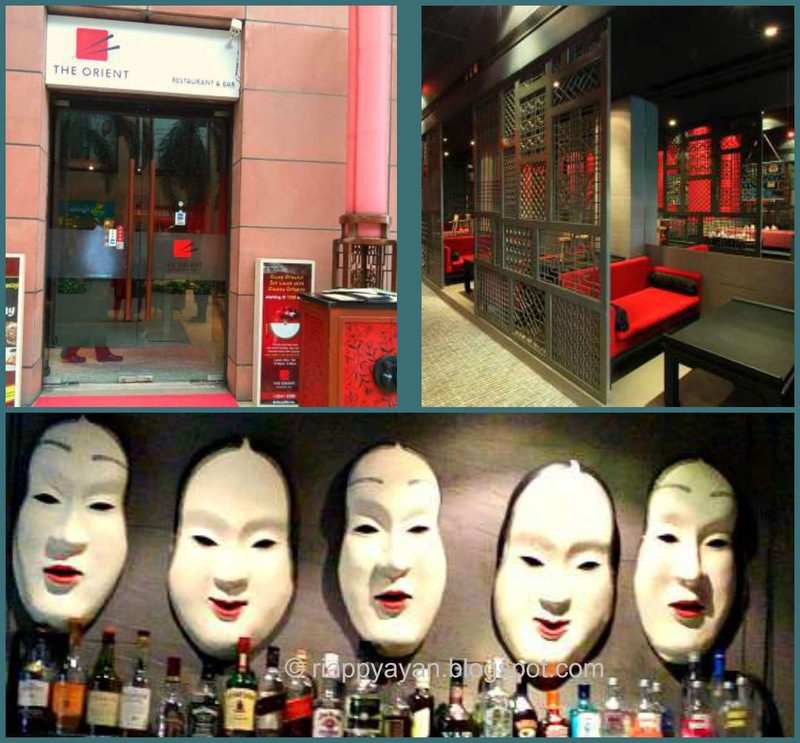 Kolkata city whose people are known for loving good food and good books, are now pampered more with gourmet restaurants one after another who are serving people of Kolkata the taste of a wide range of foreign cuisines. From Italian, Mexican, continental till our neighbourhood cuisine, Burmese. The people @ The Orient, City Center 2, organized a cooking workshop on Burmese Cuisine along with their Burmese food festival going on right now to let people know the authentic taste of Burmese Cuisine. 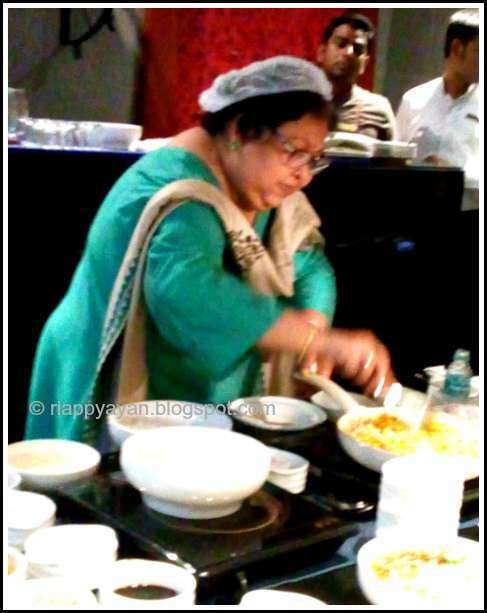 And the enthusiastic self in me of learning new cuisines, jumped upon the opportunity to watch the cooking demonstration by none other than Chanda Dutt, the master on Burmese Cuisine when The Orient invited Kolkata Food Bloggers to attend the workshop. The orient located at the ground floor of City Center 2, Rajarhat who usually serves Chinese and Thai Cuisine, is famous for their Oriental decor in red and black with individual booth system. You can have a fine dining experience with scrumptious food served in a private atmosphere unlike other restaurants of the city. Chanda Dutt, who hails from Taunggy, Burma, now known as Myanmar, is an expert in Burmese Cuisine and arranges Burmese food festival at her home every year to teach people the authentic taste of Burmese Cuisine. Burmese Cuisine is altogether influenced mainly by Chinese, Indian and Thai Cuisine. Some of the spices they use extensively are shrimp paste, fish sauce, roasted garlic, soy sauce. 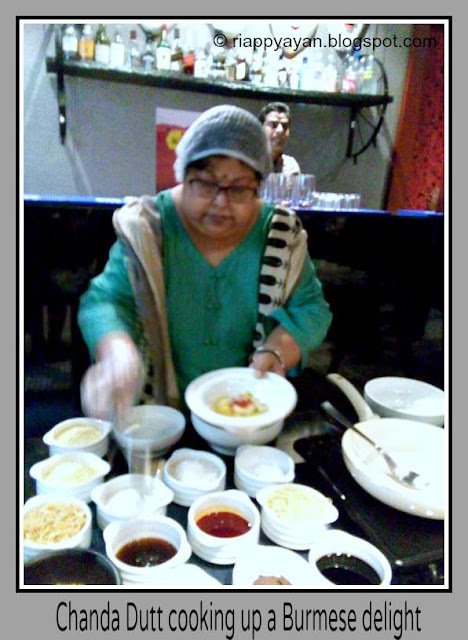 Chanda Dutt taught us three dishes, One salad/appetizer, One Chicken soup cooked with Coconut milk and one shredded dried Shrimp in onion-tomato based gravy. All three dishes were unique in taste, especially the chicken soup was out of this world, I still can't forget the taste. At first she started the cooking workshop with a Tofu salad, named Shan Tofu Salad, where shan tofu is a tofu made from Chickpea Flour and Thoke(pronounced as thohk) means salad. I never heard of a tofu made with chickpea flour. This tofu is originated in Shan states of Burma. When we asked her about the availability of the chickpea tofu in market, she explained us that it is very easy to make at home and told us the detailed procedure too. The main ingredients of this salad is the tofu and all the other ingredients like crushed garlic, fish sauce, soy sauce, chilli oil are mixed in and served garnished with coriander leaves. Altogether it makes a scrumptous meal itself. 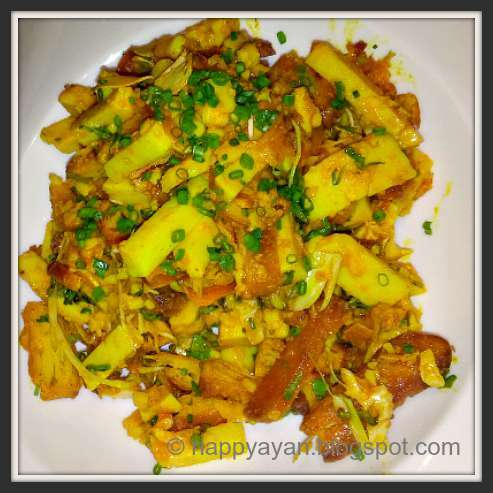 It's a very popular appetizer in Burmese Cuisine. 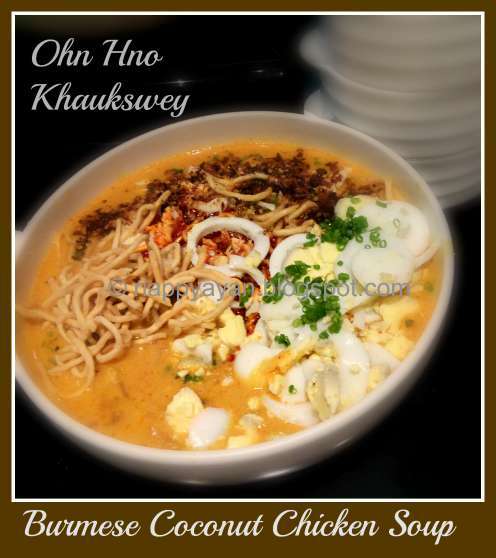 Next in the line was Chicken Khaukswey or Burmese Chicken soup, also known as Ohn Hno Khaukswey, where Ohn Hno(pronounced as oh no) means coconut milk and khaukswey(pronounced as kha swey) means a noodle dish. It is a one-pot soup meal made of egg noodles in a curried chicken and coconut milk broth. The dish is often garnished with sliced raw onions, chopped spring onions, crisp fried noodles, shredded cabbage and slices of hard-boiled eggs, and zested with lime or lemon juice, chilli garlic oil and fish sauce. Coconut milk spiced up with curried chicken and other condiments bring out an overwhelmingly divine taste which is unforgettable and no doubt this is the most popular dish in Burma, even though their national dish is Mohinga. 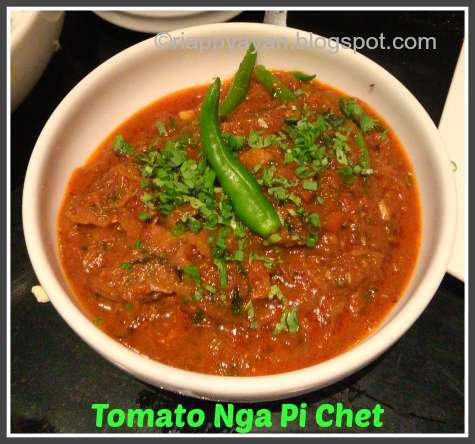 Last dish she taught was a dish made with dried shrimp in onion-tomato based gravy, named Tomato Nga Pi Chet(pronounced as tomato na pi che). Nga Pi is a term used for pungent pastes made of either fish or shrimp in Burmese cuisine. It is usually made by fermenting fish or shrimp that is salted and ground then sun dried. And Tomato Nga Pi is typically made from tomatoes and shrimp paste. Chopped green chillies, fish sauce, soy sauce, shrimp paste are added to increase its spice level. 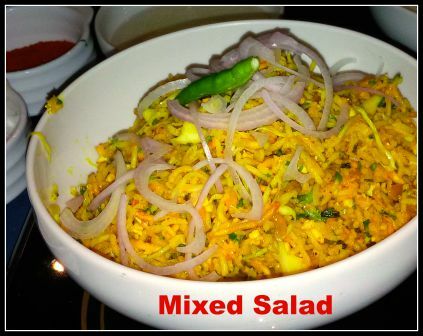 It is always served with rice and cucumber or any fresh vegetable salad by the side. After she made all these, everybody was anxiously waiting to taste all these delicious goodies. after everyone present there tasted all these, we still were craving to taste some more Burmese food. So she quickly made another amazing salad using all the leftover spices and condiments on the table, like rice, noodles, chicken, cabbage and little chilli oil, crushed garlic and sauces. We all were fully satisfied with the myriad hues of taste buds tickling in our tongue. After all the cook-up and tasting session was over, I was longing to take a snap with the chef and she happily agreed and posed beside me and my day was made. 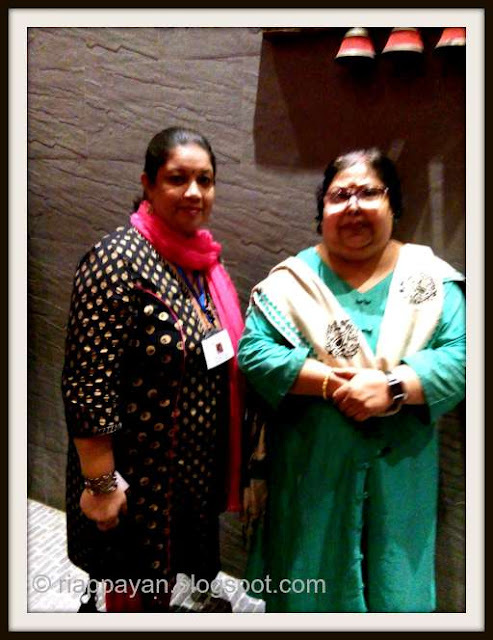 I want to thank The Orient and Kolkata Food Bloggers for giving me teh opportunity to meet her and also a heartfelt thanks to Mrs. Chanda Dutt for lovely demonstration of a cuisine that was so new to me. P.S. :: If you want to taste some more delectable dishes of Burma, The Burmese Food festival is still going on @ the Orient, CC2 till 31st Oct.